Newport Beach, Calif. – Irvine, California-based general contractor R.D. 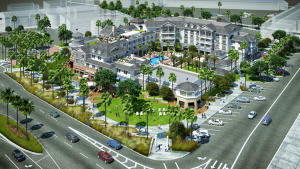 Olson Construction has begun construction on the 130-room, upscale boutique hotel, Lido House Hotel, at 3300 Newport Boulevard in Newport Beach, California, for Newport Beach, California-based developer R.D. Olson Development. With its hardie board siding, zinc-coated metal roof, aluminum-clad doors and windows, and wood-clad porte-cochère, Lido House Hotel’s Cape Cod-style exterior is designed to fit naturally into Newport Beach’s high-end, low-stress beach community. The hotel’s architecture by Irvine-based WATG will feature “Newport Nautical” details, fitting in with Lido Village and the surrounding communities. The interior décor by Novato, California-based EDG will showcase the lifestyle, history and culture of Newport Beach. Designers promise to incorporate splashes of Newport Beach history, including pop art renderings of John Wayne and a cleverly repurposed City Hall shield. Guests will be exposed to Newport Beach’s sunny weather, even from within the hotel’s interior atrium, via two roof-top skylights. Lido House Hotel will also take advantage of local talent via custom design for the property’s five two-story Balboa Suites, which will be individually designed by locally based interior designers. The four-story, 103,000-square-foot hotel is designed with a room mix that includes 124 standard guest rooms and six luxury suites with outdoor patios, including one presidential suite, two executive suites, and the five two-story Balboa Suites. All guest rooms will include wood flooring and wainscot detailing, with guest baths featuring Waterworks plumbing fixtures, tiled floors and showers, and quartz countertops. The new hotel will offer a variety of amenities to accommodate the needs of guests, as well as local businesses and the community. The property will feature 4,000 square feet of meeting rooms, a ballroom and events lawn, a saltwater pool with television- and data-equipped private cabanas and a brick monument fireplace, a high-end fitness center, and Boost, the hotel’s luxury spa. Lido House Hotel’s exterior amenities will also include an exterior courtyard along Newport Boulevard, which will feature a beachy, plank-style walkway and ipe decking to surround the celebrated ficus trees, which previously distinguished the former Newport Beach City Hall property. Lido House Hotel will offer an upscale dining experience through its full-service restaurant, the Mayor’s Table, serving up “Pacific pub-style” culinary offerings for breakfast, lunch and dinner. The Mayor’s Table’s ground floor location will be flanked by steel windows and doors and a full-brick exterior wall and include patio seating along Newport Boulevard with fire pits for guest to enjoy while dining and people watching. Top Side, the property’s ipe wood rooftop deck and lounge, will provide guests with fire-side seating options and ocean views. Construction of Lido House Hotel is planned for completion in summer 2017.